I really am having a lovely time with Marg's Terry Pratchett challenge. Having previously avoided the half dozen or so that concentrate on the wizard, Rincewind, I've now discovered them it seems and almost have a new fantasy series to read! 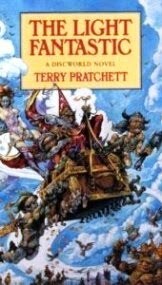 Anyway, this is book two in the Discworld series, The Light Fantastic, and is the continuing adventures of Rincewind, Twoflower, the world's first tourist, and The Luggage. In the previous book the last we see of our heroes is them falling off the edge of the world. But Rincewind can't die because the spell from the Octavo is lodged inside his head and won't allow him to die. So the next thing Rincewind and Twoflower know they are in a forest of talking trees. They come across The Gingerbread house but unbeknownst to them they are being hunted by wizards from the Unknown University who ambush them inside. They escape and meet Cohen the Barbarian, aged eighty and with no teeth, but still up to rescuing maidens in distress, which is lucky because the druids are about to sacrifice one and she needs rescuing. In fact Rincewind never spoke to this particular tree again, but from that brief conversation it spun the basis of the first tree religion which, in time, swept the forests of the world. Its tenet of faith was this: a tree that was a good tree, and led a clean, decent and upstanding life, could be assured of a future life after death. If it was very good indeed it would eventually be reincarnated as five thousand rolls of lavatory paper. 'Trees', said a voice out of the darkness, high above. It possessed what can only be described as timbre. Anyway, great fun and very enjoyable and I've now made a list of all the Rincewind books I haven't read and plan to work my way through them, starting with Sourcery and then Eric. 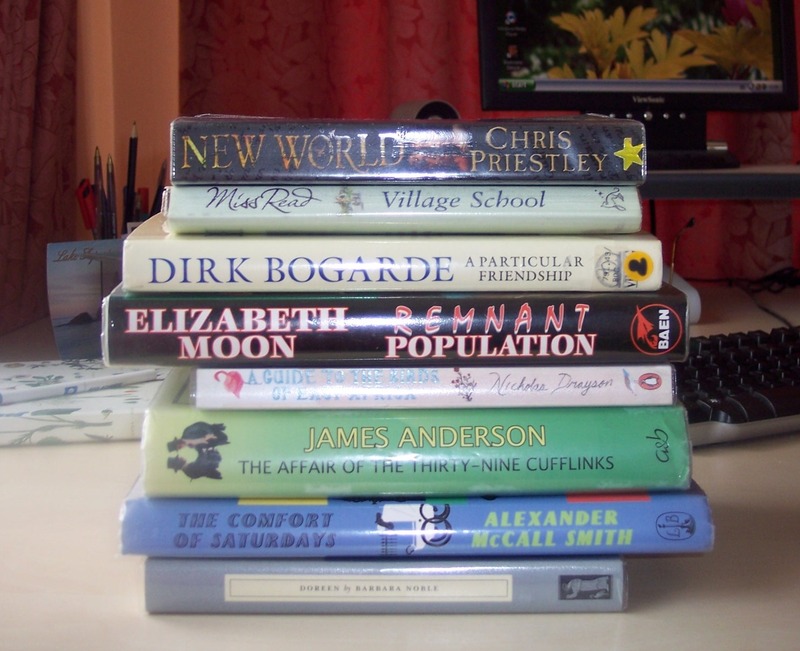 I can see I'll be reading far more than the six to eight books I'm supposed to read for this challenge! The Light Fantastic is book four for Marg's Terry Pratchett challenge and book five for Carl's Once Upon a Time IV challenge. Happy Mother's Day to all those who're celebrating it today, here in the UK we're not, we have 'Mothering Sunday' in March. Anyway, if it's Mother's Day where you are I hope you have a good day. 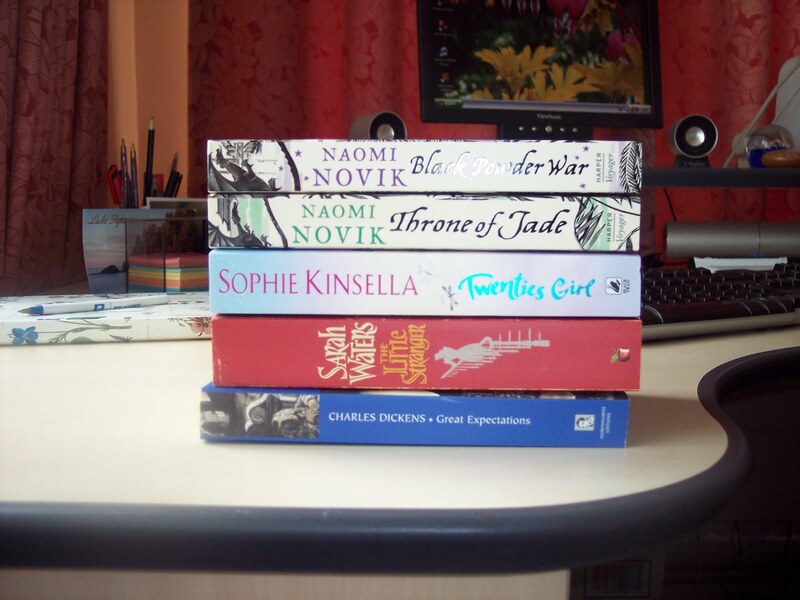 Throne of Jade and Black Powder War by Naomi Novik are from my eldest daughter. Twenties Girl and The Little Stranger are from a friend. Great Expectations is from my youngest daughter. It seems they all know exactly what I like! 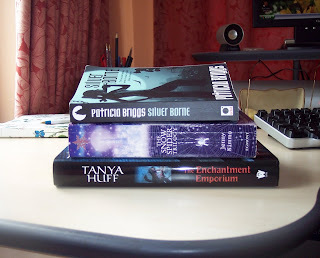 The Snow Spider trilogy was recommended to me by a friend and I'm hoping to read that one for the OUaT challenge. The Enchantment Emporium is from the lovely Pat at Here, There and Everywhere, who read it and passed it on to me. It cost her an arm and a leg and one or two other limbs to post, so thank you, Pat, I really do appreciate the gesture. 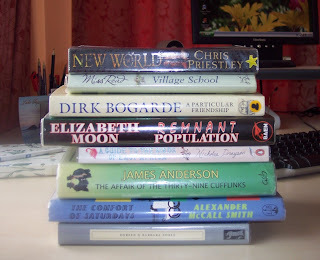 And lastly, just to make it a round number of three photos, here's my latest library pile. New World by Chris Priestley - 1500s YA historical. Village School by Miss Read - the very first of her books. A Particular Friendship by Dirk Bogarde - letters to a friend from the famous actor. Remnant Population by Elizabeth Moon - sci fi, had this a while now so must get to it. A Guide to the Birds of East Africa by Nicholas Drayson - African fiction. The Affair of the Thirty-nine Cufflinks by James Anderson - crime fiction set between the wars I think. Random grab. 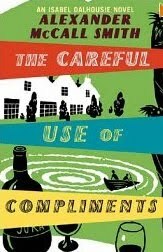 The Comfort of Saturdays by Alexander McCall Smith - book 5 in the Isabel Dalhousie series. Doreen by Barbara Noble - a Persephone seen recced on The B Files during last week's Persephone week, and about evacuation during the war. So, plenty to keep me going there. 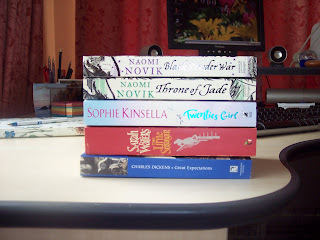 It's a good job I'm on a real reading kick at the moment *and* that I have a couple of relatively free weeks coming up! 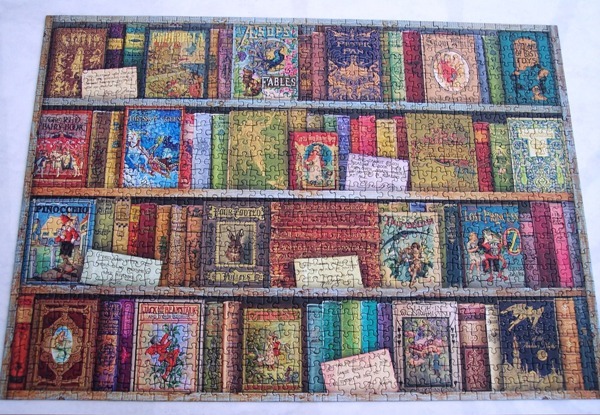 I was thinking it a miracle that I was, for once, free to do a mini challenge/read along sort of thing, in this instance Verity and Claire's Persephone Reading week. Silly me... I should have known it wouldn't be that easy. And it wasn't. I was checking my library page and discovered that someone had reserved a book I really wanted to read and that it was due back in a few days. 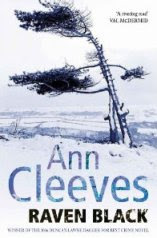 That book was Raven Black by Ann Cleeves and I've been waiting to get this one from the library for months, so there was no way I was taking it back unread. I'm so glad I didn't. Fran Hunter and her daughter, Cassie, are incomers to Shetland, although her ex-husband, Duncan, is a local. Fran has moved them both to Shetland so that she can bring Cassie up in a nicer environment and also so that she can have some kind of relationship with her father. It's Fran who discovers the body of a teenage neighbour, Catherine Ross, in a field. Catherine and her father, Euan, are also incomers having moved there after the death of his wife. Suspicion immediately falls upon Magnus Tait, a simple, almost retarded, man who lives alone. Catherine and her friend Sally Henry had made a drunken visit to his house on New Year's Eve, a couple of days previously. As he had been the main suspect in the disappearance of young girl, Catriona Bruce, eight years ago, who was never found, it's obvious that he is suspect number one now. Inspector Jimmy Perez is called in to investigate but has to make way for another team from Aberdeen, although he is still heavily involved. He is not happy about Magnus being the main suspect. Something doesn't sit right. There are few similarities between the two cases and several things happen which Magnus would not be capable of. But there are therefore many other suspects, boys the girl knew, a teacher, other adults who might be harbouring secrets. How can Perez and Taylor, the Aberdeen detective, possibly find a killer when no one wants to talk? Yet another excellent crime author discovered. Having read about this series on several other blogs I had a feeling I would like these books set in Shetland - and I really did! There's an excellent sense of place, of a very long Viking history with the background the Up Helly Aa fire festival, of bleak, wind-swept, snowy winters and it's all rather beguiling. There's also a strong sense of the 'them and us' syndrome you get on remote islands. People are drawn there for the lifestyle but how long does it take to fit in or be thought of as a local? Answer: many generations! The detective in this series, Jimmy Perez, is an interesting creation. Scruffy, describing himself as 'emotionally incontinent', he is from Fair Isle where his family still live. His mother would like him to buy a croft and settle back there and, truthfully, Jimmy is tempted by such an idyllic life. There's also a theory about the oddness of his Spanish surname which is interesting to read. As to the crime itself, the murder of Catherine Ross, the resolution came as a complete surprise to me. Which is always a good thing as far as I'm concerned, I don't mind guessing the culprit early on but it's more fun when you have no idea and get quite a shock. This was a nice, complicated crime novel with an excellent sense of place and the people who live there. I shall definitely be continuing with the series and hope that subsequent books are equally as good as this one. Sadly, although the Persephone challenge doesn't finish until Sunday, I know I won't have time to read a book before then. I've got several busy days coming up which include my birthday (surely I can't be yet another year older already?) and grandson minding... all great fun but little time for reading I fear. I have, however, just put two recommended Persephones on reserve from the library so I will be reading those within the next few weeks, so it's not a complete washout. And hopefully, one of these days, I *will* get to do one of these short challenges! There were three books I read last month that I didn't get a chance to review; I'm finding more and more that not everything I read makes it onto this blog, not sure why as it never used to be the case. I think maybe I'm reading a little more quickly now and the increased volume of books means I literally don't have time to review everything. 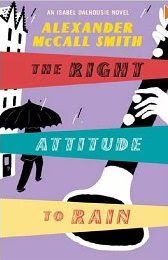 So anyway, this post will be a quick mention of those three books: The Right Attitude to Rain and The Careful Use of Compliments by Alexander McCall Smith and Callander Square by Anne Perry. In The Careful use of Compliments Isabel's life has changed out of all recognition. I can't say how as it's rather a huge spoiler but Jamie is now a big part of her life. Sadly this has caused a virtual estrangement with her niece, Cat. Two occurances form the basis of the storylines in this fourth book. Firstly, Isabel gets a letter from one of her philosophy magazine contributors, Professor Dove, informing her that she has been ousted from her job and that he is the new editor. Secondly, two paintings by the same Scottish painter come on the market at the same time. Isabel wants to buy one but there seems some doubt about the authenticity of the work. Isabel, of course, sets about investigating. This series just gets better and better. I love the little investigations Isabel undertakes, her agonising about her behaviour and that of others. I think sometimes she's not hard enough on people, her niece especially needs a good talking to! But on another subject she take beautiful revenge on someone, which was just perfect. I don't think I could love these books more, even though I realise they're not for everyone, being so character driven and 'thoughtful' and not really plot or action driven. And I think those of us who love them are unable to explain to those who don't, why we're so enamoured. Odd. Callander Square is Anne Perry's second book in the Charlotte and Thomas Pitt series of Victorian crime novels. Charlotte and Thomas are now married. Thomas's salary is not huge so they live simply in a small house - a big change for Charlotte who was brought up in a big London town house with servants and so forth. But she is happy, nevertheless. The story begins when Thomas is called to Callander Square to examine the bones of two babies found buried in the central garden of the square. It's assumed they must be the children of a servant girl who killed her babies rather than lose her job and livelihood. Thomas sets about investigating and realises there are many secrets amongst the aristocracy living in the square. Unfortunately this is a time when the police are not popular with the well-heeled and he comes up against a wall of silence. 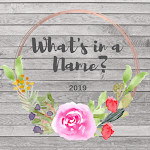 Charlotte and her sister, Emily, take an interest and before long Emily, now the wife of a lord herself, gains entrance to society in the square and gets Charlotte a position as secretary to a general who is writing the military history of his forbears. Between them can they solve this perplexing mystery? Another excellent series. The mysteries in these books are very good but even more than that I like the glimpse of Victorian life. The hypocrisy and double-standards, especially of men, are featured very strongly and this I find fascinating to read about. Many women, it seems, actually conspired to keep this kind of thing going but it has to be remembered how little power women had at that time, relying on men for their very existance. Being the subject of gossip was one of the worst things that could happen to you and being an outcast from society a very real threat. So you kept your secrets. Fascinating stuff and I plan to read as many books in this series as I possibly can.